Your cakes are simple but stand out like pieces of art. What is the key of your success? With each cake that we make we want it to be unique for the bride and something that has real style and elegance. 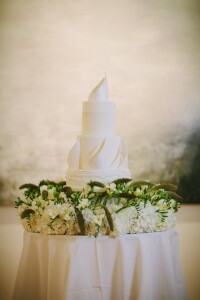 The process starts by looking at the couple’s story, and how it connects with nature, architecture, painting, interior design – any inspiration apart from other cakes. If you start with other people’s cakes it is almost impossible to create something that is beautifully different. Once you have the inspiration I think the key to a good cake design is simplicity, an eye for detail, and a stunning quality of finish. When you bring those three together you get a cake that really shines and delights the bride, and after all that is what it is all about – creating the kind of cake that when the couple see it across the room, they know they have been completely understood and celebrated in a way that is uniquely about them. 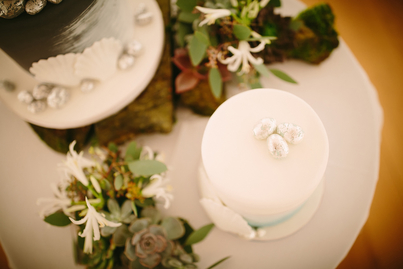 A cake that was particularly memorable to you? We love styled photoshoots because often you have a huge amount of freedom to create something that is rather more unusual than traditional weddings allow. For a recent theatrical themed wedding photoshoot we created a 5 foot tall black and gold cake with unique forest-like branch separators. It looked dramatic and absolutely stunning. We are so delighted with it – the branch separators, luminous gold leaf, and the height all combined to make a cake that lingers long in the memory. However, knowing that most brides would prefer white to a black in their wedding cake, we have created a white and gold version for our upcoming Spring collection. How was the idea of the Duchy Collection born? We deliver cakes all over the UK, and particularly to London, but we are proud to be based in the amazing county of Cornwall. It is a place of real beauty and grandeur and is a great inspiration for all kinds of artists. We decided to bring some of that inspiration to our cakes by basing each cake in the Duchy Collection on a place in Cornwall: from the stunning natural arch of Mill Bay caught in a fiery sunset to the sweeping seascape of Gwithian. We have been delighted with the reaction there has been in the collection. Are you going to create another delicious collection in the future? Yes! We are really excited to launch our “S P A C E S” wedding collection at the Dorchester on April 1st & 2nd. 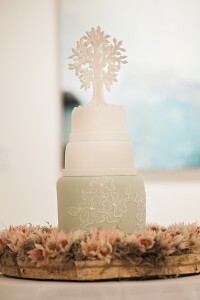 It is a collection of 3 cakes that all play with how cake tiers can be separated in artistic and intriguing ways. We like our cakes to surprise and delight. The Golden Pond cake (the one with the branch separators) is one of the S P A C E S collection, but the other two are even more spectacular. For the time being you can feast your eyes on these amazing cakes at www.peboryron. com, and I very much look forward to tasting the new collection!